Insofar as there is any sort of policy-oriented "debate" going on, in connection with the upcoming Presidential election, it is probably best characterized as a debate about the appropriate role that "government" should play in the economy, vis a vis "the market." President Obama's remark, "you didn't build that," has been used to heap scorn on the idea that "government" has any positive role to play, where economic growth and development are concerned. Considering the topicality of the controversy, I was pleased to read a recent book review in The Wall Street Journal (the edition for Saturday/Sunday, September 22-23, 2012). The Journal, of course, is preeminently a playbook for the 1%ers. The book reviewed (generally panned by Brendan Boyle, the reviewer) is entitled The Rise of Rome, by author Anthony Everitt. Brendan's critique is that The Rise of Rome is based far too much on anecdotal sources that spin what is no more than mythology into a purported history. To understand how "a small market town by a ford on the river Tiber" was able to "conquer the known world," and thereby establish "the grandeur that was Rome," Brendan thinks that we need to look to more empirical sources, those containing actual "data" about transactions and events. Brendan particularly highlights data and events about "the market." He cites research showing how the rise of Rome was really a reflection of Rome's market success. This analysis, of course, is only to be expected in a review in The Wall Street Journal. These government efforts, Brendan appears to argue, were quite important to the success of Rome. They helped build "the market." In fact, it looks to me like Brendan is advising all those "we love the market" types that while the market is important, so is the government. 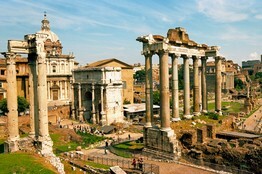 If I have it right, where Rome is concerned, the "market" didn't build that!